Activity 4.3: Convection (p. 36-37; click here for videos accompanying this activity). A good grasp of the underlying principles of thermal physics is essential for understanding how the ocean functions and how it impacts climate. Thermal physics is one of the science subjects that students are familiar with and experience on a daily basis, but intertwined with the experiential knowledge they bring to class comes a mixed bag of misconceptions that must be identified and addressed. Example misconceptions include an inability to differentiate between heat and temperature, the notion that transfer of heat will always result in a temperature rise, and a misunderstanding of the concept of latent heat. The purpose of this activity is to review basic concepts of thermal physics and highlight applications to ocean processes by focusing on the concept of convection. Convection and advection are the major modes of heat transfer in the ocean and atmosphere. Convection occurs only in fluids and involves vertical motion of fluid, or flow, rather than interactions at the molecular level. 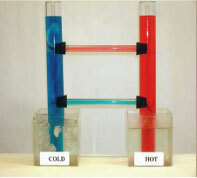 It results from differences in densities - hence buoyancy - of fluids. Examples of convective processes include: currents in Earth's mantle, which drive the tectonic system and result from heating and cooling of magma; atmospheric circulation resulting from uneven solar heating (e.g., between the poles and the equator); the global ocean conveyor belt and formation of deep water masses, resulting from cooling of surface water at high latitudes; and vertical mixing in the ocean's upper layer due to variations in heating between day and night. Advection usually refers to horizontal transfer of heat with the flow of water (e.g., the Gulf Stream). Read the following sections of Chapter 4 (Heat and Temperature) in preparation for this activity: Background (p. 32) and Mechanisms of Heat Transfer (p. 33). Credit: Karp-Boss, L., E. Boss, H. Weller, J. Loftin, and J. Albright (2009). Teaching Physical Concepts in Oceanography: An Inquiry Based Approach. Oceanography 22(3), supplement, 48 pp.